Three members of the graduate’s family were forcibly removed from the auditorium after shouting “you did it, girl”. A few days later, the celebrants were charged with disturbing the peace. They face a $500 fine and possibly six months in jail. Superintendent Jay Foster defends the decision to prosecute. Graduation is a solemn occasion, he says, and families have a right to hear their child’s name announced in a stone-quiet auditorium. 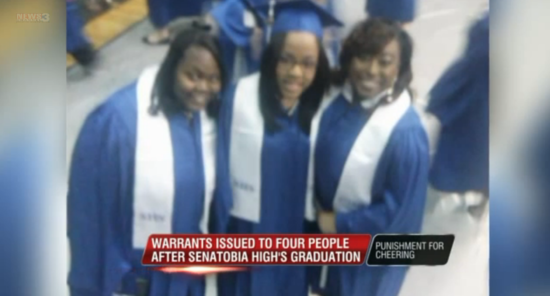 For the middle class white men who preside over graduation ceremonies in towns like Senatobia, graduation may be a solemn affair. They went to college (a much bigger deal than high school) and their children are expected to follow suit. High School graduation, for these people, is the first step down a long road of gradual advancement. But for the children of field hands, Wal Mart employees and truck drivers, high school graduation is whoopin’ and shoutin’ time; there’s nothing solemn about it. There is no pomp in this world. The circumstance is bleak. In many cases, the graduate crossing the stage is the first person in the family to get a degree of any kind. It’s a triumph for the entire clan–a watershed moment. I understand this respectable – working class divide very well. During our family’s nine years in Tulia, Texas we watched the social drama unfolf year after year. The vice principal would tell the audience that applause should wait until all graduates had received their degrees and that unseemly outbursts would not be tolerated. This rule held until the first Black, redneck or Latino graduate was announced. After that each family outdid the last in voicing its pride. Hell, if they didn’t cheer real loud, how would the town know how proud the family was? More importantly, how would the graduate know? Sure, there was an element of “take your pomp and shove it” class warfare involved in this annual drama. The Hoi Poloi knew the ruling cadre of respectable professionals was asserting its authority and they rose to the challenge with gusto. In the end, no harm was done. The principal waited for the brief burst of celebration to pass before announcing the next graduate. Everybody heard the name of their child announced loud and clear. The authorities in Tulia knew that white professionals had become a tiny minority in the community. Apparently, the ruling white class in Senatobia, Mississippi isn’t ready to throw in the towel. Having laid down the law, they are going to make it stick even if it transforms their community into a national laughing stock. Jay Foster thinks like the folks who gave us the Tulia drug sting and the Jena 6 fiasco. Make no mistake, this is all about enforcing white privilege by all means necessary. Totally Alan!! Cannot fathom how a town could make a charge like that stick in court … but then again as you say it is one group asserting priviledge over another. Canot imagine that happening here! Even though school staff always say’Wait till the end’ no one does and no one seems to care much.I had no trouble hearing my children’s names and our supportive comments were certainly not the loudest in the auditorium!! As far as I know, no parents were ever charged or convicted.